She’s gorgeous but why is she famous? This stunning beauty is a retired rhythmic gymnast with two Olympic medals, 14 world championship medals and 25 European championship medals. She may sound like your typical Russian gold medalist but the cherry on top of the icing is her role in Russian politics (was State Duma deputy from the United Russia party). Currently she is the chairwoman of the board of directors of the National Media Group. Other gorgeous Russian women look up to this lady. She won the the title of Miss Russia in 2003. Her work as the director for the Miss Russia pageant was brief but she did become a model (appeared in several magazines like Cosmopolitan and Maxim) and a popular TV hostess. Into gorgeous Russian women with brains? You should meet Alexandra Konstantinovna Kosteniuk. 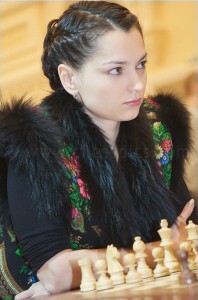 Her name may be a handful to say but that’s nothing compared to how grand her achievements are – Russian chess Grand Master and a former Women’s World Chess Champion. If her face isn’t familiar to you then you probably don’t pick up a lot of fashion magazines. Eugenia is a Russian model with a successful modeling career. She’s worked with brands like Yves Saint Laurent, Valentino V, Eres and Victoria’s Secret. It’s also not a surprise since she really breath taking, especially the depth and beauty in her eyes. Watch a lot of Russian television? You’re probably going to know who Victoria is. She’s the Russian singer who won Star Factory-5 – a talent search show that had about 7 seasons. Since her win, she’s had several career opportunities as a singer – songs debuted, songs maid into movie soundtracks, voiced main characters in movies and etc. These beauties have brought more proof to the claim that Russian women are the most beautiful women in the world. These 5 examples are merely starters. There are dozens of gorgeous Russian women that you can meet online. They may not be as famous as these 5 but they definitely do not fall short in the beauty and talent department. Do you know of other famous and gorgeous Russian women we can add to our list? Comment the names below and let us do the research for part 2. For more tips and posts about Russian women – how to meet them online, where to find them online, how to approach them online and offline – check back in soon. Don’t forget to like and share the post if you think Russian women are the most beautiful creatures you’ve set your eyes on.